Dennis Miller discusses the state of comedy – including why he won’t perform on college campuses, & what he thinks of SNL – and the state of politics: why he prefers Trump over Hillary, the dearth of moderates, & why he calls himself socially liberal. 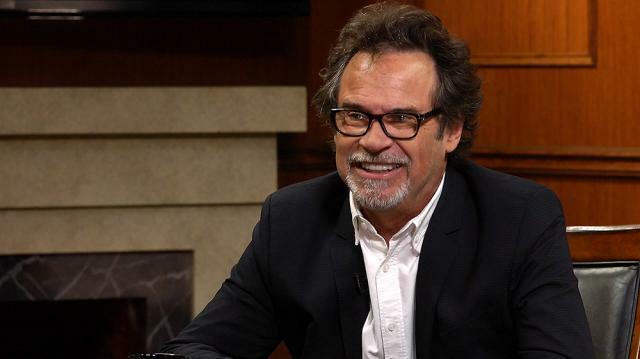 Larry King interviews Dennis Miller, a comedian, host, actor, political commentator, andNew York Timesbestselling author. Miller be a guest host on Turner Classic Movies for one night a week for a month. Larry asks why he’s hosting, and Miller says he finds the world is going mad and that he wants to return to when things made sense. They talk about the late Don Rickles, whom they both knew; Larry for 58 years and Miller for 58 minutes. Miller recounts an anecdote when Rickles humorously swore on Miller’s show, and they exchange other funny stories about Rickles. Larry asks more about Miller’s TCM hosting, and Miller says he will host a month of science fiction B-movies, and exchanges more celebrity anecdotes. From personal stories, Larry turns to politics. Though Miller has said he doesn’t judge presidents until after six months, Larry asks for Miller’s current thoughts on Trump. Miller thinks it’s a dangerous world, and describes himself as a conservative who is socially liberal. He mentions that though he’s never publicly revealed his vote for president, on a ballot between Hillary and Not Hillary, he would have chosen Not Hillary. Even though Trump’s outer voice can be unbelievable, Miller believes it is also his inner voice, while he doesn’t think Hillary’s outer and inner voices have ever matched. Larry inquiries about Miller’s experience as a conservative in Hollywood and if he is shunned, but Miller says that he’s so socially reserved that he wouldn’t know if he was. Miller says his politics are pragmatist, and that he doesn’t believe people can have tepid opinions in the middle now. When asked if he’s optimistic or pessimistic, Miller replies that he thinks the world is in a troubled place, citing that college campuses used to be centers of knowledge, but are now close-minded. Larry asks Miller to speak his mind about comedians and which ones he considers funny. Miller believes being a humorous comedian is more important than being an important comedian, and names a few rising stars. Larry asks Miller how he feels about being impersonated, particularly by Tom Hanks, and Miller regards it as a compliment. Another time Miller felt flattered, he explains after Larry asks if he was the brightest kid in high school, was when he made a popular player laugh, despite being a socially awkward kid.